South Jersey Gas has submitted a proposal to put a natural gas pipeline through a portion of the Pinelands Forest Management Area. The proposal would place 22 miles of 24-inch pipeline through Atlantic, Cape May, and Cumberland Counties in order to provide the B.L. England Plant located in Beesley's Point, Cape May County with natural gas. Sweeney's Meddling Compromised Pinelands Commission's Independence," Op Ed in the Star Ledger by Amy Goldsmith, March 20, 2015. The construction of the SJG pipeline will cause long term harm to Pinelands forests and waterways: habitat loss, compaction of soils, more runoff and erosion in waterways, changes to hydrogeology potentially impacting aquifers and groundwater. 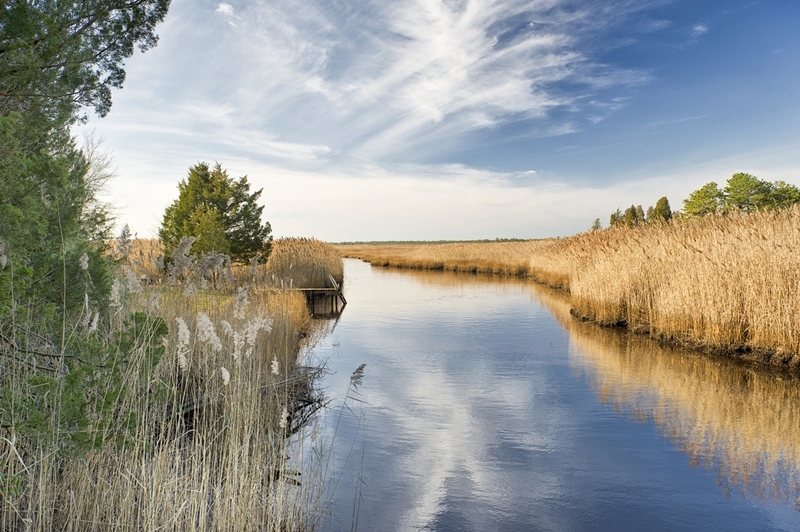 The Pinelands is a national treasure and provider of clean drinking water to millions of state residents and home to a trillion gallon aquifer. Clean Water Action has joined a coalition of over 40 organizations to stop the pipeline from being built. Our 40 organizations represent hundreds of thousands of New Jerseyans and voters who also oppose the pipeline. We've been successful in stopping it so far, but the fight is far from over. In February 2017, the NJ Pinelands Commission approved the South Jersey Gas pipeline route. The 15-member regional land-use and environmental board erred in finding the natural gas pipeline to the B.L. England power plant will “primarily” benefit Pinelands residents and businesses so we are going to appeal the approval in court. Contact the NJ Pinelands Commission today! Express your disappointment in their latest vote to approve the South Jersey Gas Pipeline. The Pinelands are a World Unesco site, home to such diverse and unique plant and animal species, it has been classified as a World Biosphere by the United Nations. Seventeen trillion gallons of pristine, drinking-water flows beneath the Pinelands through the Kirkwood-Cohansey acquifer. The pipeline would endanger the water supply for South Jersey and increase the state’s dependence on dirty, fossil fuel. The Pinelands is a globally rare ecoystem, home to plants and animals found nowhere else in the U.S. One of the largest freshwater aquifers in the U.S. can be found within the sandy soils of the Pinelands. The proposed route through the Pinelands Forest Management Area violates the Pinelands Comprehensive Management Plan (CMP). The CMP permits such public service infrastructure in the Forest Management Area only when it is "intended to primarily serve the needs of the Pinelands." N.J.A.C. 7:50-5.23. There is no exception for pipes to run along or under roads. The South Jersey Gas Company wants to install a large, high pressure gas pipeline through the heart of the Pinelands to carry gas from Pennsylvania to resurrect the BL England Power Plant at the mouth of the Great Egg Wild and Scenic River. The plant was built in 1961 and burns coal and oil. It is under orders to close down or convert to natural gas, and for the past several years has only operated for peak demand. Every year that BL England continues to operate without cooling towers, it kills millions of fish, larvae, eggs, marine mammals and sea turtles and emits over 1.2 million tons of CO2 into the air. Pinelands Commission When the Pinelands Protection Act was passed in 1979, it established a 15-member independent public body known as the Pinelands Commission. The Commission is responsible for enforcing the CMP. The Commission must defend the integrity of the Pinelands or risk larger, cumulative harms in the future. The Pinelands was created in part in response to plans to construct off-shore drilling platforms and run transportation pipes across the Pinelands to refineries on the Delaware. The drilling did not happen forty years ago, but it may happen in the future. Similarly, proposals for Liquefied Natural Gas (LNG) terminals along the Jersey shore continue to be pressed, raising the possibility that pipes would be proposed across the Pinelands to transport LNG. On Friday, January 10th, 2014, the full Commission voted on a resolution that would have authorized the Commission's Executive Director, Nancy Wittenberg, to enter into a Memorandum of Agreement with the New Jersey Board of Public Utilities allowing the construction of a 22 mile, 24 inch diameter natural gas pipeline. The final vote was tied 7-7 resulting in a stunning victory for the environment. They needed 8 votes in the affirmative in order to advance this project. Voting in favor of the project: Commissioners Avery (Ocean County), Brown (Cape May County), Earlen (Burlington County), Galletta (Atlantic County), McGlinchey (Camden County), Quinn (Gubenatorial Appointment) and Witt (Gloucester County). Voting against the project: Chair of the Pinelands Commission Mark Lohbauer (Gubenatorial Appointment), and Commissioners Ashmun (Gubenatorial Appointment) , DiBello (Federal Representative), Ficcaglia (Cumberland County), Jackson (Gubenatorial Appointment), Prickett (Gubenatorial Appointment), and Green (Gubenatorial Appointment). Here is a link to Chairman Lohbauer's video of his statement. Abstentions: Commissioner Lloyd was forced to recuse himself from the vote. He is appealing that decision. What is the Pinelands Commission? The Pinelands Commission is made up of 15 Commissioners: One member is appointed by the U.S. Secretary of the Interior One member appointed by each of the seven counties with land in the Pinelands (Atlantic, Burlington, Camden, Cape May, Cumberland, Gloucester and Ocean. The remaining seven seats are filled by the Governor subject to review and consent of the New Jersey Senate. Members of the Commission serve staggered three-year terms. The Governor also appoints the Chairperson. Pinelands Commissioners have final say with regards to all development activities regulated by the Pinelands Comprehensive Management Plan (CMP). The federal legislation states, "The membership of the planning entity shall include residents of the Pinelands National Reserve who represent economic activities such as agriculture in the area, as well as residents of New Jersey who represent conservation interests." Commissioners serve without compensation. We are working to steer the conversion of B.L. England toward renewable energy and the creation of green jobs. The current site is already part of the electrical grid and can accommodate any type of renewable energy generation such as solar panels and wind farms. For more information, contact us at 732-963-9714 or njcwa@cleanwater.org.